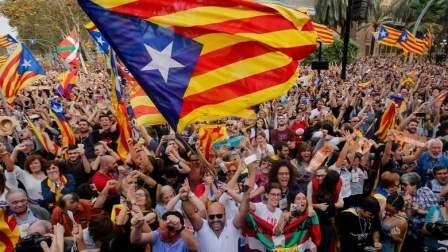 Catalonia's parliament voted Friday to declare independence from Spain and proclaim a republic, just as Madrid is poised to impose direct rule on the semi-autonomous region to stop it in its tracks. A motion declaring independence was approved with 70 votes in favour, 10 against and two abstentions, with Catalan opposition MPs walking out of the 135-seat chamber before the vote in protest at a declaration unlikely to be given official recognition by Madrid and abroad. Tens of thousands of independence supporters massed near the Catalan parliament cheered with joy after majority separatist lawmakers voted to declare independence from Spain. Watching proceedings in parliament on two large screens, they clapped and shouted "independence" in Catalan before singing the regional hymn, many raising their fists. Spanish Prime Minister Mariano Rajoy vowed Friday to "restore legality" in Catalonia after the regional parliament declared independence, as Madrid was poised to take direct control of the wealthy region. "I ask all Spaniards to remain calm. The rule of law will restore legality in Catalonia," he wrote in a Twitter message immediately after the Catalan assembly voted in favour of declaring independence from Spain.